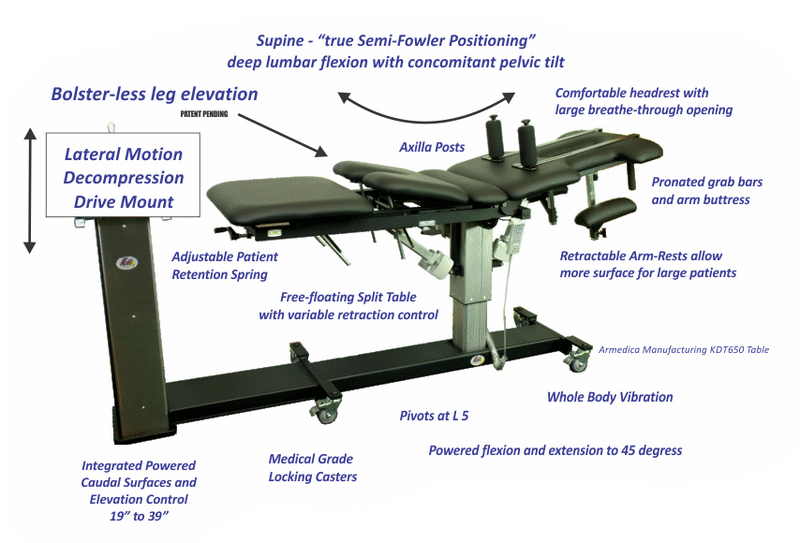 KDT Neural-Flex Technology Decompression Therapy System with Pelvic Drop (optional), Inversion, and Vibration. Lumbar, Prone, Supine, Side Lying, Flexion, Extension. Standard Components include the KDT-655 Neural-Flex Table, the MTD4000 Decompression Drive, KDT Clinical Cervical Device with pillow, QuickEazeII TM Belting System (Thoracic, Pelvic & Extender Flap); Max Relax Face Cushion. Optional Accessories not included with the standard components: KDT knee bolsters, SlipStopTM Traction Blocks, KDT Half round ankle positioning bolster, Axilla Posts, Versa-Belt Modality Belt, Rachet Style Pelvic Belt, Carpal/Ankle / Hip Strap, Inversion Ankle Rolls, KDT Seminar Hands-on Certification Class. Also available in 220v power. Call for details. The KDT Neural-Flex accommodates more than 11 postions.